Rather, the tactical knife is in a category of its own. Officially, a tactical knife is a knife with one or more military features that is designed specifically for use in extreme conditions. It may or it may not be used as a combat weapon; it can just as easily be used for utilitarian purposes as well. Most tactical knives, however, will have a blade length of between three to five inches. Since tactical knives really belong in their own category, there is a slightly different set of criteria that you need to keep in mind when on the market for one. We will talk about what this criteria is, as well as the best tactical knives on the marketplace, in this article. First and foremost, the quality of the materials used in your tactical knife simply cannot be called into question. Damascus steel is held in high regard by professionals around the world, with some considering it the best blade material available. Other high quality blade materials for tactical knives include High Carbon, Sandvik, and AUS-8 steel. The handle for your tactical knife needs to fulfill two separate functions: it needs to be ergonomic, meaning it’s comfortable to hold, and it needs to be grippy, meaning it’s non-slippy. There are a variety of different grip materials available, including leather and G-10 and hard plastic and even steel. Honestly though, it doesn’t matter what handle you choose so long as it meets the above criteria. Only you can decide what is ergonomic for you and what isn’t, though choosing a non-slippery grip is something that’s more objective rather than subjective. Why is comfort so important in choosing a tactical knife? The reason why is because if your knife is not comfortable to use, you simply won’t use it! It really is as straightforward as that. This is also why ordering a knife online without testing it out first in person will be a big mistake. Yes, there are plenty of good deals online and you might be able to save money through an online purchase versus buying in person. But an alternative strategy that you can follow will be to test out a knife at an actual store and then, after finding the one you like, buy it online. Alternatively, you could just order a knife from an online dealer and then have it sent back if you don’t like it, but you’ll also have to deal with shipping costs and an added time frame before you’ll find the knife you like and deserve. While choosing a knife with a durable material and an ergonomic and non-slippery grip are absolutely essential, the actual design of the knife you choose is also essential. The best tactical knives will have a serrated or partially serrated blade versus a straight edge. This is to slow down the amount of time before the blade dulls and needs to be resharpened, and also so you can use the knife as an improvised saw-type weapon if you need to as well. Another key feature in the design of your knife is it to have a strong clip so you can keep it attached to the inside of your pocket for quick and easy access. Just make sure it’s not too tight, since you want to be able to draw it quickly if need be. First of all, the Benchmade Contego is hardly a budget knife, so if you were looking to save money when buying a knife this is definitely not the best one for you. But if, on the other hand, money is not an issue and you just want quality regardless of the price, then this is one of the best options there is. Benchmade is a highly reputable brand name in the world of knives, and their Contego model is no exception. The lock, referred to as the AXIS lock by Benchmade, is designed to resist over eight hundred pounds of pressure without breaking. The opposite end of the handle also features a glass breaker which can be used as an emergency device for escaping a vehicle. The blade is constructed out of CPM-M$ steel that is designed to hold an edge for a very long period of time. In fact, the extreme sharpness retention of this knife is reason enough alone to pay for the higher price. The handle is built out of G-10, which is very slippery resistant and easy to hold onto in wet conditions. All in all, the Benchmade Contego delivers everything that Benchmade has become known for, though you’ll have to pay a higher price to get it. If you weren’t looking to spend so much on a knife as the Benchmade Contego is priced at, then another cheaper but nonetheless very high quality option you can look at is the Cold Steel Recon 1 Tactical Knife. This knife comes installed with a durable blade machined out of AUS 8A stainless steel that has further been treated by vacuum heat for optimum performance. The blade is further coated in a black Teflon material that is not only designed to stop glare but also to resist rust and corrosion. At a weight of just around five ounces, the Cold Steel Recon knife also has a G-10 grip that is ergonomic and non-slippery. As the finishing touch, the Tri Ad locking system form Cold Steel keeps the blade firmly locked into place when opened. Another highly reputable brand name in the knife world is Columbia River Knife and Tool. Founded in the mid-1990s, they quickly built a name for themselves not only for their knives, but their other products and tools for outdoor enthusiasts as well. This is a classic tanto knife built out of a high quality stainless steel with a hardness rated up to 59 HRC. This means that the blade is not only highly durable and resilient, but it will also hold an edge over an extended period as time. The blade, which measures 3.86 inches, is further coated in titanium nitride, which makes it non-reflective and very scratch and corrosion resistant. The overall length of the Columbia River Knife is nine and a quarter inches, with a folded length of over five inches. Kershaw have been consistently producing good quality knives all the way back since the mid-1970s. 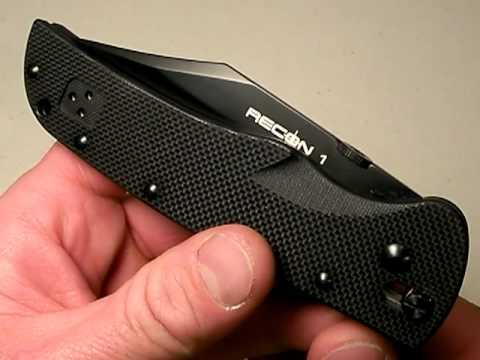 Today, they are most well known for their tactical knives meant for EDC use that they produce. 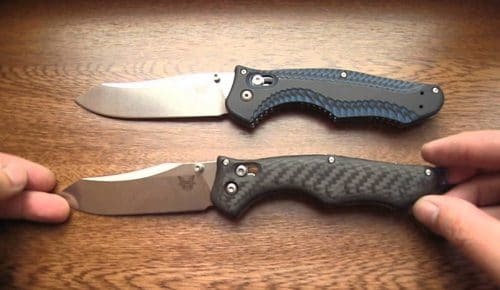 Some of their knives are built in the United States and others are not, but you’ll be glad to hear that the Blur is an example of one of their American made knives. Equipped with a glass breaker, as the name suggests, the recurve blade is partially serrated. The breaker is built out of carbide, while the handle is built out of anodized aluminum handle. Trac-Tec Grip Tape has been installed over the handle for a secure grip in wt conditions. The SpeedSafe opening mechanism from Kershaw allows you to deploy the knife quickly in an emergency situation. As the finishing touch, Kershaw sells the Blur Glassbreaker Knife with a lifetime manufacturer’s warranty. The Mtech USA Xtreme MX-8054 knife actually has the distinction of being a fixed blade knife in contrast to a folding one like the previous models on this list. While this means that it would obviously be a poor choice for EDC or concealment use, it’s still an excellent option to keep in a sheath and strapped to your side when you’re in the outdoors. The blade measures 6 inches with a handle length of 5 inches, for a grand total length of 11 inches. The blade has a thickness of 5mm, with the handle being built out of a G-10 fiberglass laminate material. There are four screws on both sides of the handle in order to prevent any chance of it from coming loose. The finger grooves on the grip further add to the ergonomics of this knife. One of the downsides to this knife is that it is a little heavy at thirteen ounces, but most of that weight comes from the highly durable 44 stainless steel that the blade is made out of. Here is another fixed blade tactical knife that we will talk about: the SOG E37SN-CP Seal Pup Elite knife. First and foremost, this is a highly corrosion resistant knife thanks to the black TiNi AUS-8 blade (which, by the way, measures five inches). The knife was thoroughly tested by being placed under salt water for two weeks, and it emerged from the water without any rust or corrosion at all. The blade is not serrated like most other tactical knives, but it is still capable of cleanly cutting through virtually anything, whether it be rope, wood, or flesh while cleaning a kill. Finally, the handle of this SOG knife is also highly ergonomic and slip resistant thanks to the ridged jimping. In the end, a tactical knife is designed for use in extreme conditions. Even if it may not be used as a tactical weapon and instead be used for utilitarian purposes, this still doesn’t mean that you should purchase a knife that is less than military grade. In the list you have read over, we have compiled a list of some of the best tactical knives on the market and have also included both folding blade and fixed blade options. It’s up to you to choose wisely so you can get the best one for your purposes…and one that will last you for many years to come.